My name is Peter Long. I am the musical director of the Ronnie Scott’s Jazz Orchestra, and for the last thirty years of my life I’ve been researching and re-creating the music of Duke Ellington. This has gone quite well. The band has received awards, toured Europe and has been one of a handful of large British jazz ensembles to tour the U.S. While driving in the car this time last year, “Venus” from the Planets Suite by Holst came on the radio. It suddenly struck me how Ellingtonian the curves of the melody were, and how Holst’s warped, flowing harmonic symmetry was so redolent of that of Ellington’s composing partner, Billy Strayhorn. It was a long car journey, and by the time I’d reached my destination, the broad idea of re-orchestrating the whole suite for an Ellington-style orchestra had coalesced. Ellington playing the classics is not without precedent. in 1960, he recorded two suites of pieces, the first being a Christmas release of Tchaikovsky’s Nutcracker, and the second a shorter but very effective treatment if Peer Gynt by Greig. I had a template! What makes these works so effective is that Ellington and Strayhorn left the original themes recognisable, but at the same time adapted them to sound like convincing jazz compositions. Like the Nutcracker and Peer Gynt, the Planets is full of very strong well-known melodies, and like one of Ellington’s own suites from that period, the Planets consists of short pieces linked only by their inspiration and excellence- no fixed themes running through the whole. Conceptually as well as musically, I knew I was onto something. The first stage of the operation was to fix how Holst’s melodies were going to receive a jazz treatment. My process was to go through the score with the recording and mark off where the obvious themes were. In the classical setting, there is much embellishment and extension sewn into the orchestration. In the jazz orchestra, this work is often done by the improvisations of the original musicians, so essentially this was a process of reduction. A jazz number naturally scans in eight bar chunks. If it doesn’t, the balance of the music can be thrown awry, and so the next task was to produce a song copy style leadsheet with the themes contracted or expanded to fit this template. This is the process Billy Strayhorn used in many parts of the Nutcracker. Bearing also in mind that Ellington’s jazz of 1960 was almost exclusively in 4/4, I had to do quite a bit of surgery on Mars, which is in 5, and Neptune, which is in 7. This follows Strayhorn’s example in the Waltz Of The little Flowers, which in his version was a hip-switching shuffle in very broad 4! One of the great joys of brewing Holst’s harmonies down from his orchestral score into leadsheet style chord symbols was that I quickly learned that Holst was speaking the same harmonic language as the cutting edge jazz artists of the mid-1960s, but in 1918! The next phase was to take these leadsheets out onto small band jazz gigs and play them as if they were ordinary jazz standards. This accomplished two things- firstly it enabled me to see how these tunes sat in a jazz context, and make small adjustments as necessary. Secondly, I was able to gauge public reaction. After eight months’ work, I was delighted that the reception was universally warm and enthusiastic. Now I had my Planets functioning as jazz melodies, the last stage was to produce the Ellingtonian arrangements- I embarked on a heavy listening programme of Duke’s recordings of the time, most notably the Far East Suite, Anatomy Of A Murder, Suite Thursday and of course, Peer Gynt and The Nutcracker. As well as incorporating as many of his compositional and orchestrational devices as I could (This would fill another whole paper) I did as he would, and re-cycled some pre-existing material. Therefore, Duke Ellington’s planets begins with the title track from his 1958 album Blues In Orbit, as orbit seems a perfectly logical place from which to start a journey around the solar system. I merged two unrecorded Billy Strayhorn compositions, just as he did with Pentonsilic in the 1944 work, The Perfume Suite, to form “Pluto, The Uncertain” with which to conclude our journey. This has been great fun. it has revealed an enormous amount about both Ellington and Holst, and I hope that the result is exciting, illuminating and humorous in equal parts. I have tried out Jupiter and Venus at Ronnie Scott’s with the band there now to big rounds of applause, and will be performing the work in its entirety there on July 8. I have prepared this suite of pieces as best I can to the mores and methods used by Ellington and Strayhorn in the late 1950’s and early 1960’s. This period saw many of the great Ellington extended works come to fruition, especially the Nutcracker and Peer Gynt suites, which served as the basic inspiration for this adaptation of the Planets. I’ll make the specific references as I go along. Holst’s setting for his planets was astrological. Thus Venus was subtitled “The Bringer Of Peace”, Uranus “The Magician” and so forth, with the music reflecting their mythical properties rather than anything physical. Our journey through the solar system differs in that being of the post Star Trek generation, we are much more at ease with the concept of sailing along between heavenly bodies.Consequently our journey starts in orbit above our home planet, and reaches out as far as Pluto. Pluto was not known to Holst at the time, and so is absent from his work. However, when applying Ellington’s methods to this work, it is important to remember that he would use the highly individual solo voices available in his orchestra to create melodic inspiration and tonal atmosphere. In general, this is the most notable factor in Ellington’s writing, and to a large extent the thing that separates him from his peers. During the above mentioned period, he and Strayhorn produced a suite called “Such Sweet Thunder”, a sequence of pieces dedicated to the characters and situations to be found in Shakespeare. He went as far as casting in some detail original Shakespearian characters to the members of his orchestra. Given that Holst’s Planets is similarly character driven, it seemed to me to make sense to assign each movement to one soloist. The musicians in the Echoes Of Ellington have been selected on the basis that they are the most capable artists in the field of re-creating the sounds of their corresponding player in the original Ellington orchestra. By thinking which of Ellington’s soloists would be best served by the various melodies of the Planets, it was quite a simple job to decide who was going to play what! Thus each movement is a tribute to one of Ellington’s stellar soloists too. They each demonstrate the symbiosis which exists in the mutual influence between composer and musician, and celebrate jointly the genius inherent in both Ellington and Holst. On top of which there is a seam of humour running through the whole thing. It seems to me that people are always amused hearing these famous classical melodies in fancy dress, as it were. To add weight to a suite, Ellington would often include earlier work. Here we have a really late-night feel to open the show. This is actually the title track from the album of the same name from 1959, but given its title, I felt it formed the perfect place from which to start an Ellingtonian trip through the cosmos. I’ve cast trombonist Chris Traves as our heroic pilot. His abilities to make the trombone talk cut him out as the prime candidate for all the in-flight announcements in every movement. Here, however, we get the full pre-flight briefing in the spaceport under the harsh 2a.m. strip lighting of the opening saxophone chords! James has an unusual ability- he can re-create the highly stylised flugelhorn bebop of jazz virtuoso Clark Terry, so much a feature in Ellington’s work at this time. In the orchestral score, the high-velocity running of Mercury around the heavens is portrayed by fleet strings and woodwinds running fast up and down a series of scales which, funnily enough would prove very popular with jazz musicians around forty years later. When people say that Holst is very Jazzy, they’re not quite nailing it. Jazz can be very Holsty! In our version a high velocity swing groove is the thing. He’s a winged messenger, not the second class mail! I used as the main building blocks the two main strains of singable melody in the original, and, indicating the scale patterns of Holst’s woodwinds on his part, I had Jim do his own thing on them at mercurial speed in the style of Clark Terry. For the same money. Terrifying! Colin is widely renowned as the best impersonator of the serenely sonorous alto saxophonist Johnny Hodges that there is. The big Hodges ballad often forms the centrepiece of an Ellington suite, as it does here. When we were in Chicago performing the Shakespeare suite, a very old lady came to the bandstand and asked to speak to Colin. It turned out that she had been Hodges’ girlfriend and that when Colin played, she said that it made her feel that he was alive again. A beautiful moment, but a heavy one! Venus was the hardest of the original tunes to shape into something that sounds like a jazz standard. Although the melodies are glorious, they are of very irregular lengths, and jazz tunes need that regularity, and so some considerable pulling, pushing and tweaking of the original was required. From the opening pilot’s announcement from Chris’ trombone up to the piano setting up the groove before Colin’s entry, this one is pure Holst, the original orchestral notes just being transferred to the instruments of the big band. On the first run through, trombonist Callum Au complained that I’d not included the violin solo from the original, and that it was his favourite bit. Reasoning that this extra melodic strain would provide a nice contrast in the flow of my adaptation, I did a second draft which included it. Because he’d been a smartarse, I gave the melody to Callum to get on with, top E flat and all. Right from the get-go, I felt that Mars would need to be a vehicle for Louis Dowdeswell. Louis is able to compress air down a trumpet like no-one else alive, which gives him a high register facility on the trumpet which is frankly disturbing. He is the only trumpet player I’ve heard capable of reliably hitting the notes of Ellington’s stratospheric soloist, Cat Anderson. Mars needed to be big. Holst’s original is huge, and a big band just doesn’t have the tonal resources of an 80-piece symphony orchestra with its legions of brass, walls of percussion and tsunami of low strings. We do have Louis, though. The colour of the trumpet in the register he is capable of operating is so vivid and penetrating that I felt we would be able to create the impact that the orchestra can. It also focuses young Louis as the specific character as the bringer of war, armed as he is with a fire-breathing lightsaber of a trumpet. Musically, I had to ponder long and hard about the rhythmic basis for this treatment. To create suspense and unease, Holst positions the entire composition over a five-beat pattern. It is most unlikely that Ellington would, in 1960, be inclined to play anything in five, especially a melody which is so redolent of his earlier work on the Cotton Club. I therefore contracted the groove by one beat per bar, and lengthened the main melody carried in the saxophones to an eight-beat pattern over two bars of four. Trying this out in the workshopping stage at clubs and on musician friends, it quickly became apparent that because the original melody with its compelling arcs of dissonance are so strong, the missing beat soon disappeared from everybody’s attention. Perhaps I should have a go at accountancy. This one represents a bit of performance problem solving, and also permits a bit of astronomical authenticity. You have to traverse the asteroids if you want to get from Mars to Jupiter. It is, as you will hear, two of the four melodies contained in the original movement Jupiter. For reasons I’ll discuss later, I wanted Jay Craig to take the main solo role, but I felt it would have strained the art a bit to have him take four tunes in a row. I also wanted to feature some straight ahead trombone and tenor sax jazz at some point in the show, especially as another defining feature of Ellington at this time would be the sinewy improvisations of tenor saxophonist Paul Gonsalves. In Mike Hall I have access to that sound, and as everybody likes a fight, I wanted him to engage in a jazz duel with trombonist Au, who can really stoke the fires a la Britt Woodman. To give this some interplanetary theatrical shape, I hit upon the idea of trying to portray our spaceship getting into a spot of bother in the maelstrom that is the asteroid belt, two of the crew need to go out as the pumice is raining down thick and fast and unclog the particle conversion emitters, or something. The engine starts again and off we go to.. The hymn section of this is one of the most loved melodies we currently have on our planet, and so I figured that it would be a wise move to present it in a pretty straight way, and let the genius of its construction do the bulk of the work. In my mind this had to be a baritone sax solo performed by Jay Craig. Jay is a huge avuncular presence right across the music business, and an absolutely genuine bringer of a vast amount of jollity! He was frog-marched as a teenager by his visionary music teacher to watch Ellington’s band play a concert in the Usher Hall in his hometown of Edinburgh. Transfixed as he was by the cavernous glory of Harry Carney’s baritone sax mere feet away from him, he has made it his life’s work ever since to emulate his idol. It was often said that Ellington’s band had two saxophone sections- Harry Carney and the other four. Jay is as happy on a rock-steady groove as he is on a heart-rending ballad, and I wanted this arrangement to incorporate that. He gets the first theme as a mambo, changing to swing, and then the big tear-jerking moment on the hymn. I decided to end with a typically Ellingtonian ending for the time, whereby the arrangement peters out to just the soloist and the piano. In the real world, this would be Ellington’s sleight of hand at work, as he always composed right up to the deadline, and details such as a through-composed ending could easily become overlooked. In the case of Ella Fitzgerald and the Duke Ellington Songbook from 1959, he had Billy Strayhorn on all fours in the control room writing out the next arrangement while the band ran down and recorded the previous one, the ink still wet on the parts! I learnt a lot doing this one. Jazz was even more Holsty that I’d imagined. Virtually all of this arrangement is the original orchestration taken from the score and re-assigned to the instruments of the jazz orchestra. The only big difference is that it is all over a complex ostinato bass pattern, performed by Joe Pettitt. The sombre nature of the piece leant itself to this treatment. In the Shakespeare Suite, we have a piece entitled Half The Fun, and in the Nutcracker there is Arabesque Cookie where a sensuous melody slowly weaves its way over African sounding drums and unrelenting double bass. Joe is one of the new generation of bass players who play entirely acoustically, and has the physical strength to make his strings cut through the wall of sound that is the big band. Although this is viewed as something new, it is in fact the old fashioned way of doing things. Joe also runs his own band, serving up finely crafted concerts of big band nostalgia and ballroom dancing up and down the country. I’m glad he found it funny when he was cast as the Bringer Of Old Age! If we were to attempt to put a label on the piano style of Ellington himself, we could do worse than to say that its roots are in the stride tradition. Colin Good is a giant on the scene when it comes to stride piano, specialising in the work of Earl Hines, but also utterly and completely versed in the techniques of Teddy Wilson, Basie and of course, Ellington. As Holst’s original had a rumbling, minor feel, it seemed logical to me to translate it to the rumbling, minor shuffle feel that Ellington loved to play so much around this time. Loping bass plays around shards of piano harmony as the first of the two melodies coalesces from the rhythmic brew. Throughout this Movement, Holst uses a four note motif as a punctuation point, and I’ve incorporated it to flag up changes in the mood. One of the trickier ones to adapt for the big band, as Neptune is a passing series of opalescent orchestral timbres with no definite melody. The harmony is a different matter altogether, as its basic opening pattern is echoed in many swing era warhorses such as 9.20 Special or Swingtime In The Rockies. I eventually settled on the opening figure played on the flutes to provide the melodic hook, and placed it all over a soothing latin pattern. Much of the end of the original is given over to an ethereal climbing pattern in the strings overlaid on a womens’ choir. Not having either a string section or singing ladies to use, I’ve adapted the phrases to form a slow-burning swinging climax, before the final fade out on Clarinet and Piano echoing the original. I didn’t really want to feature myself, but some of the lads in the band advised me that it would be bad showbiz if I didn’t. The limpid melodic strains of the melody well suit the supple tones of Jimmy Hamilton’s clarinet, and so in the quiet high register passages and flurries of whole tone scales I did my best to emulate him. I hope you enjoy it. Conceptual fun here. As earlier mentioned, there is no Pluto in the original. I did what Ellington did on many occasions and dug out a fully formed unrecorded Billy Strayhorn piece. Famous examples of this are “The Star Crossed Lovers” from Such Sweet Thunder, written six years earlier and entitled “Pretty Girl” and “Isfahan” from the Far East Suite, enigmatically going under the name of “Elf”. Here we have a wonderful piece of swing modernism from 1944 originally entitled “Le Sacre Supreme”. It features the searing, passionate trumpet playing of Ryan Quigley, one of the most remarkable new voices on his instrument to have come through in the last twenty years. Not having any original text to draw open, I could pretty much say what I wanted. The premise is that being at the far rim of the solar system, Pluto forms the frontier post with the rest of creation. What do you get at frontier posts? Bars, that’s what. As well as being the gatekeeper, Ryan runs the bar. Listen to how he presides over the hubbub of voices from our interstellar visitors with his incontrovertible jazz. 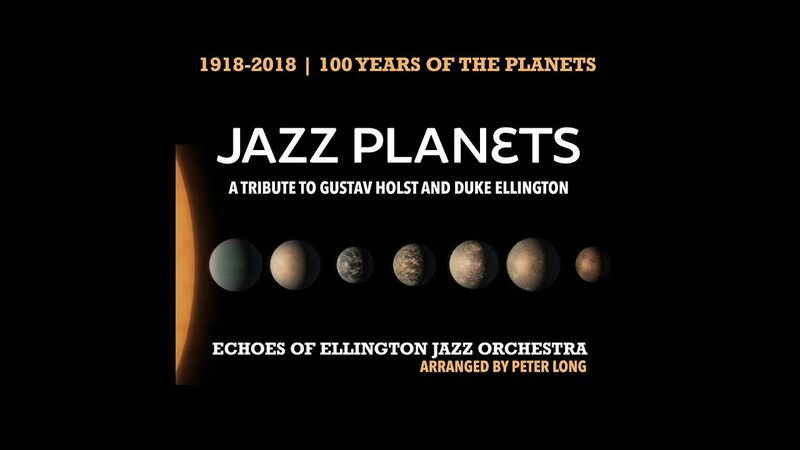 WHY IS IT "DUKE ELLINGTON'S PLANETS" AND NOT JUST THE "JAZZ PLANETS"
Ellington and Holst share the ability to pull off the same clever trick. Both composers use a very high degree of sophisticated harmony and rhythm, but have the ability to infuse the whole thing with a high level of humanity with their incredible abilities as melodists. Without this and the extra magic ingredient of genius, listeners would be turning off in droves. Everybody who hears Ellington’s music in the flesh completely gets it, and the Planets has been a massive public favourite since its first performance in 1918. If you root around inside the music, you will find that the technical similarities between the two composers far outweigh the differences. Ellington is regarded as the pre-eminent American composer of the twentieth century. His music transcends mere jazz by dint of its extended forms, open structures and unique symbiotic orchestration. Only a credo as massive as his could take on the weight of Holst’s masterpiece and provide the method for translating it into something other. Ellington’s music is regarded as something special by all jazz musicians. Ellington himself tried to distance himself from having his work referred to as “Jazz”, trying instead to have it referred to as “Music”. Of all the jazz composers, it is Ellington who has to the greatest extent become a formal concert artist. Thus he is best equipped to stand at the junction between the two worlds of Classical and Jazz. Ellington has a history of taking classical music and having it adapted to his orchestra. In 1960, he had success with his records of the Nutcracker and Peer Gynt. The Planets follows logically on from these two works. Jazz itself is a massive arena now. It has become a world music, and so it is now a very nebulous question to define exactly what it is. Is it an avant-garde brass ensemble in a New York Basement Club? Is it a baritone saxophonist jamming in quarter tones with a Gamelan? Is it a Rod Stewart album of standards? Who knows. What is needed to shine a new light on the Holst work is a narrow enough focus to give the suite cohesion. The five reasons above explain why it will work following Ellington’s example. I really like Duke Ellington. I really like the Planets. It’s my project, so there. Nerr. In 1914, a young man called Edward Ellington wrote a simple piano piece entitles Soda Fountain Rag. Over the next sixty years, he would compose a cannon of work which would have him recognised as the foremost American composer of any genre. Nicknamed Duke by his schoolfriends because of his regal bearing, Ellingtons music contains a unique blend of contrasts and contradictions. At once visceral and elegant, intimate and shouting, traditional and progressive, the music is unique, exciting, earthy and refined. The Echoes Of Ellington was first formed in 1994 to celebrate the Duke’s music, and to bring it by live performance to a modern audience. Jazz enthusiasts the length and breadth of the nation, and later on in Europe and the United States were amazed by the group’s ability to get inside the scores and really bring out the Ellington flavour. Today, the orchestra is in its finest incarnation yet, with highly specialised virtuoso players on all the instruments who understand intimately the nuances put on the page by the Duke. Whether a familiar standard such as Satin Doll, or a rare marvel from one of the Suites, you can be sure of a sonic big band journey like no other. The show is conducted and presented by clarinettist Peter Long, who over the years has built a reputation as the pre-eminent big band frontman in the United Kingdom today. As well as keeping you entertained with the music, he will ensure that you will leave the show with a little more background information than you were expecting, heightening the experience of hearing the music by understanding. With 22 years in the Coldstream Guards band entertaning Her Majesty, Andy has previous experience with the Planets, having played Holst’s original arrangements of Jupiter and Mars adapted for military band. Andy is no stranger to playing his trombone in space, having been a part of an antiphonal brass ensemble in a hot air balloon 100 feet off the ground. With a foot in the classical arena too, there’s not much point listing Andy’s CV, as he’s in everybody’s band! Accurate, versatile and powerful, and one of the few leading professionals to have not gone through the college system, Nathan has brought his classy approach to the BBC concert orchestra, Guy Barker’s big band, the Ronnie Scott’s Jazz Orchestra and too many west end shows to mention. Originally trained on the bassoon, Colin settled eventually on the more romantic alto sax, belying his reserved Edinburgh roots. Now at the top of the music business tree as both a musician and a composer, Colin’s talents have shone brightly in his own collaborations with Matt Skelton in the Skelton-Skinner all-stars, his compositions for the LSO and the BBC Singers. Hailing from the jazz hotbed that is Blackpool, Callum started playing and subsequently arranging in his teens. Since then, his arrangements have been played by Claire Martin, the Metropole Orchestra and Curtis Stigers. He first became known as a trombonist in the ranks of NYJO, and subsequently in the Ronnie Scott’s Jazz Orchestra. As a bandleader himself, Callum has recorded the album “Something’s Coming”, the centrepiece of which is his re-working of West Side Story. Owing to a freak birth accident, Louis is able to play the trumpet higher than anyone else, and for the same money too. In the normal register on his instrument, Louis has played for Robbie Williams, Michael Buble and Alfie Boe. Additionally, Louis has become a YouTube sensation on his own channel presenting big band re-workings of classic melodies. Due to his incredible panache and talent, Louis now has millions of followers. Mike is head of jazz at the Royal Northern College Of Music. Starting in NYJO, Mike spent 25 years working with the iconic British jazz composer Michael Garrick. The 2013 Manchester Jazz festival saw the Thelonius Monks commission go to Mike for his groundbreaking work, “With Criminal Intent”, a unique fusion of Baroque and Hard Bop. Mike’s deep love of the oblique style of Ellingon’s tenor sax soloist Paul Gonsalves makes him the natural choice for the solo chair in our band. Known as the Frome Flash. Having the unusual attribute of having never made a mistake, Simon can play any wind instrument in any style. Need rock soprano sax? Give Simon a shout. Recital standard bass flute? Call Simon. You get the picture. His faultless virtuosity has led him to work with Dame Shirley Bassey, and he can be found all over the West End like its rising water table. Jay’s incandescent career started in the United States with the legendary Buddy Rich. Lucky amongst musicians, Jay has got to play with many of his heroes including Frank Sinatra, Tony Bennett, Billy May and Bill Holman. His regular playing credits include 26 years in the BBC Big Band, Stan Tracey, the Syd Lawrence Orchestra and the John Wilson Orchestra. He is also a sought after big band director, both at the BBC and with his highly acclaimed own band. Derry born and Glasgow raised, Ryan has been the dominant voice on the Scottish trumpet scene for the last fifteen years. As well as his stellar playing abilty, he is a prolific big band composer and arranger, and has produced a variety of concerts stretching the big band idiom into such diverse and popular fields as the Beatles and Motown. Touring and recording credits include Quincy Jones, George Michael, Aretha Franklin, Miuchael buble and the Metropole Orkest. Having taken the London scene by storm, James has, in his short career, established himself in a wide variety of musical habitats. He can be found in the Royal Philharmonic orchestra and everywhere in between to fronting his own quintet at Ronnie Scott’s. Jim is a founder member of the Patchwork Jazz Orchestra, which serves as a forum for contemporary composition. For years recognised as the leading exponent of 1930’s piano style, Colin shocked the entire jazz community by going on the road for fourteen years with none other than Bryan Ferry! Now back from his stint on the Pop Gravy Train, Colin is now a leading light in the Shoreditch Vintage Jazz Movement. As well as being a regular contributor to Not So Modern Drummer and the director of the Jazz Repetory Company, Richard is known throughout the musical community for his mastery of vintage and period drum styles. Playing an original 1940 Slingerland Radio King kit, his big sound and lilting groove means that he is first call for all things swing. His great knowledge of the genre means that whenever there is a radio or TV programme commissioned involving the big band era or before, you’ll find him nestled somewhere in the proceedings playing his drums or talking from his encyclopaedic knowledge. A project such as this really requires that the double bass player can make the instrument heard without using an amplifier. Joe is so strong that he can crush concrete with his bare hands . As a result, we often have to ask him to ease off a bit! A true renaissance man on the bass and guitar in all their forms, Joe plays the whole gamut from folk to funk. He is also a ballroom dancing specialist, leading his own orchestra at all the big dance events. Many years ago, Chris landed the lead trombone job in the West End production of Chicago, a post he held for fifteen years. As part of the job, he had to master the difficult art of playing the trombone whilst growling from the throat and waving a sink plunger over the bell. This produces the “Talking” tone on the instrument which originated in the Duke Ellington orchestra and is such a significant ingredient in the soundscape. After fifteen years of eight shows a week, Chris is now the master of this technique. For the right money, he can also play the instrument normally. His other great talent is as a sound engineer, and his great ear and consummate technical knowledge of the acoustic recording process have made our recording sing with the unique clarity that you will enjoy. Somewhat more of a treat for jazz buffs than classical fans, I venture. But to hear players this skilled let loose in fresh fields is exhilarating and Long can be proud of this.